This is the first of a three-part series on the Prosperity Gospel, the belief that God wants people to be financially prosperous. First, we need to answer, How many people adhere to the Prosperity Gospel, and how widespread are its messages? I use logit analysis of data collected by SRBI in 2006. (After listwise deletion of missing data, N = 665.) Below we see that the average person (i.e. all independent variables set at their means) in the U.S. has about a 5% chance of identifying as a member of a Prosperity Movement. The chances of agreeing that God wants people to be financially prosperous are much greater at 61%. 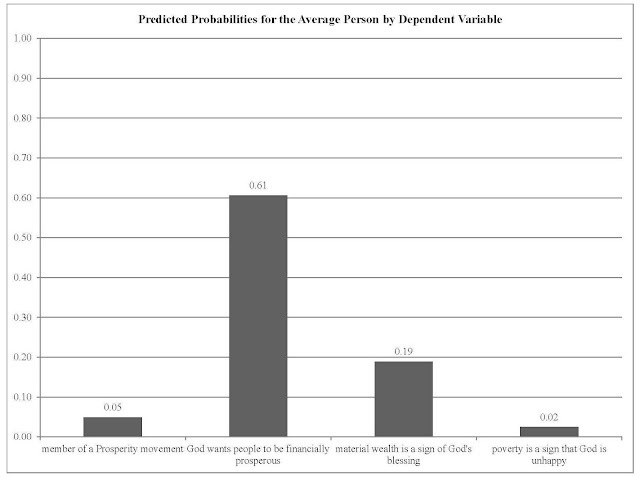 The chances of agreeing that material wealth is a sign of God's blessing are lower but still meaningful at 19%. The chances are much more muted for agreeing that poverty is a sign that God is unhappy with something in your [sic] life at 2%. In the next post, I will address the demographics of the Prosperity Gospel adherents.